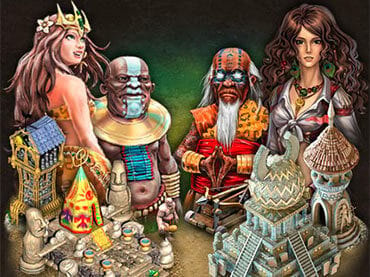 Totem Tribe 2 – Jotun is a MMO (massive multiplayer online) game. This game requires a lot of strategic thinking and problem-solving skills. The quests given is a mixture of mystery, adventure and puzzle games, all in one. From the sky to the sea, the quests are both challenging and fulfilling. The tribe needs a dynamic hero, one that can complete the quest and collect sufficient resources to build the village. Fortunately, you are the only one that can bring peace to the planet of Tanya. As you build it with a high technological material, the village will advance through the ages; from stone age to the highly advanced space age. Together with the help of your high tech village, you can stop the Evil God - Emperor. Quick! Don’t let the tyrannous God-Emperor rule Tanya. If you have questions about Totem Tribe 2: Jotun game, please contact us using this form.